... is waiting to be discovered! 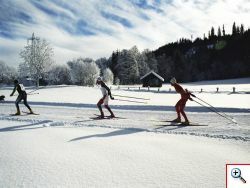 Why not try a new sport such as ice stock shooting, or treat yourself to a relaxing and romantic horse-drawn carriage ride? 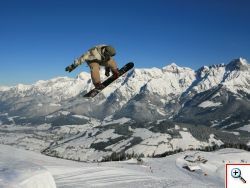 Maria Alm offers plenty of excitement in winter. ...in the family-friendly Hochkönig ski area. 34 cable cars and lifts and 150 km of slopes at an altitude of between 860 and 1,900 m are waiting for you in one of the most beautiful ski areas in the Alps. The Hochkönig is part of the “Skiverband amadé” area, which opens up fantastic opportunities to our winter guests: Your ski pass is valid in 5 regions, 25 resorts, and includes 860 km of slopes and 270 lifts! 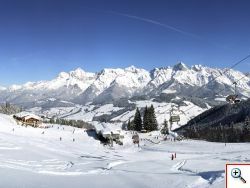 The perfect blend of unique snow conditions, professionally groomed slopes, modern lifts and cosy huts make your winter holiday in the Hochkönig ski area truly memorable. Whether you are a beginner or a professional, on skis or on a snowboard, the large number of lifts means you can have a relaxing day’s skiing without having to queue. Snowboarders or new school skiers will find many a challenge here too. Several snow parks and easy parks, including one in Maria Alm, and the annual Hochkönig Style Championship mean that you will not miss out on any fun and action. Night skiing beneath a starry sky is available twice a week on the Simmerlift in Maria Alm.